Ladylike fashions returned to spring runways with a slight vintage feel. We saw pretty 1950s-inspired looks from Prada and Jil Sander, and return to the 1920s jazz age from Louis Vuitton. Oscar de la Renta and Nina Ricci embraced soft feminine hues in their collections worthy of a princess. Their delightful jewellery left us swooning for all things sparkly and feminine. Prada's gorgeous drop statement earrings are making us reach for exuberant baubles like Kenneth Jay Lane's oversize chandelier earrings. 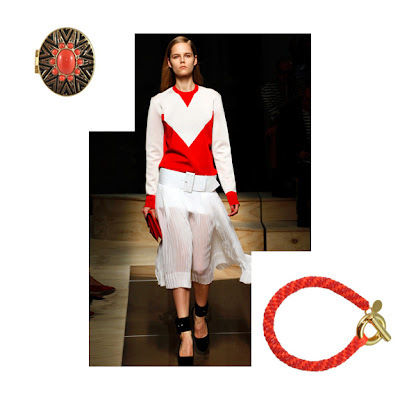 Jil Sander enlisted Erickson Beamon to supply jewels for the house's S/S collection. The theme was 1950s ladylike stylings, reminiscent of our vintage hero, Sherman. How could we not love Louis Vuitton's 1920s-inspired looks? The collection featured headbands, which left us reaching for Jennifer Behr's thin crystal headwraps. Oscar de la Renta is all about femininity, and this season is no exception. 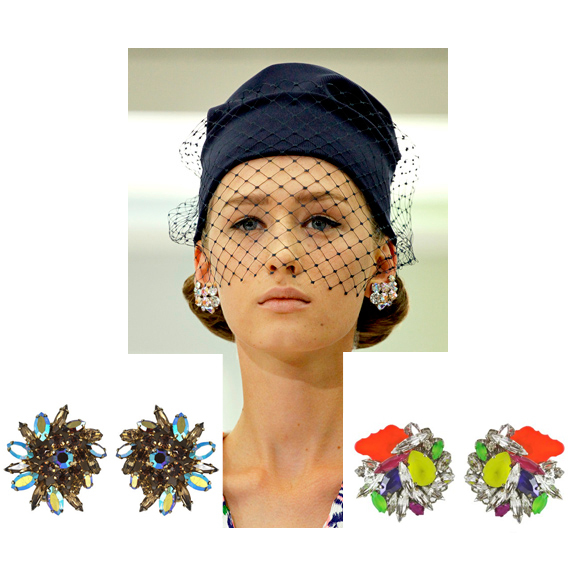 We love the crystal encrusted button earrings as they remind us of Jacques Fath's 'Chez Maxim' collection. 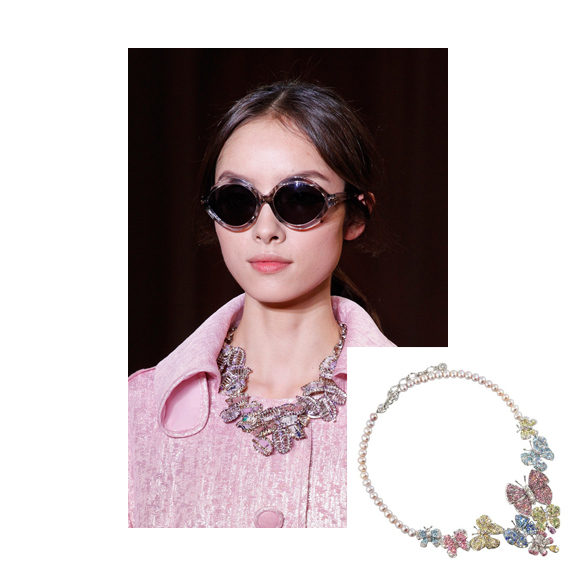 Nina Ricci's rich fabrics and textures were paired with statement necklaces in soft pastel hues, prompting us to pull our stunning Siman Tu butterfly necklace out of the closet. The awards season is here, meaning that we are swooning over all the gorgeous red carpet fashions worn by Hollywood A-listers. Last night at the Golden Globes, there were many beautiful gowns, but eye sharp little eyes were on the stunning jewels. Two Golden Globe nominees, Michelle Williams and Charlize Theron opted for romantic headbands, a look we of course love. The two headbands couldn't have been more different: one was tiara-like with dazzling little diamonds, and the other a black jewelled headwrap echoing the 1920s. Supermodel Heidi Klum opted for a more casual, California girl look with her chic and simple beige Calvin Klein dress, accented with a bright turquoise necklace. She looked so fresh and lovely. Salma Hayek is a bombshell and she certainly dresses like one. Her gold Gucci column gown was a stunner, and so were her beautiful gold vintage chandelier earrings. Redhead beauty, Julianne Moore, looked elegant in her black Chanel gown paired with Fred Leighton's bold green emerald drop earrings. We love the green jewel tones -- a subtle yet bright way to stand out in the crowd. The ageless supermodel Elle Macpherson's gown may have been a tad bit bridal for the occasion, but we adore her stacked Lorraine Shwartz bangles. Mixing multiple textures and tones is somewhat of an art form, and Elle really perfected it here. If Golden Globes looked this good, imagine what the Oscars will be like. Can't wait. Happy New Year! 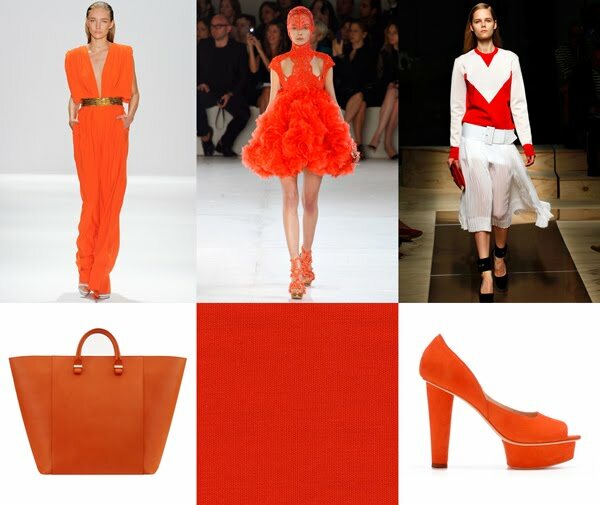 It's time to think bright for spring with 2012's "colour of the year" Tangerine Tango. This bright reddish orange hue appeared on countless runways including Alexander McQueen, Celine, Carlos Miele, Peter Som, and Oscar de la Renta. Accessories, of course, are also following the trend, with shoes and bags from Alexander McQueen, Bottega Veneta, Victoria Beckham, Loeffler Randall, and Christian Dior, just to name a few. But let's not forget about bright tangerine jewels! For an antique look, we love both Kenneth Jay Lane's opulent turquoise and coral brooch, and the beautifully simple feather bracelet by LeiVanKash. For a more sporty, casual look that echoes Celine S/S 2012, we love Noir's new 'Shaka' lanyard bracelet with gold hardware, and House of Harlow's 'Tribal' ring (it's a little art deco too, no?). And for those ultra glamorous moments, we are coveting Kenneth Jay Lane's dramatic oversized chandelier coral earrings, and Bounkit's stunning beaded coral cuff.